Clothing Sizes For Your Kids. S. M. L. XL. Your kids grow so quickly. And suddenly the new clothes no longer fit! You measure your kids' height once and then »What fits when?« tells you which sizes fit right now – and when the next ones will fit. Handy when shopping for clothes, or at the next yard sale. You love to travel? Switch to EU, UK, US or Japanese sizes with a single tap. Buying souvenirs has never been easier. their sizes at a single glance. And the nextb ones, too! Buying clothes overseas? Don't worry! Switch between EU, UK, US and Japanese sizesa with a single tap. Your kids' datac is transferred to your other mobile devices, and nowhere else, via Apple iCloud. Each clothing brand uses their own patterns and size charts. Therefore the sizes recommended by the app may differ from the best fitting size of actual pieces. Growth rate calculation is based on the WHO Child Growth Standards. However all children are different and grow at their individual pace. Therefore accuracy of estimates may be limited. 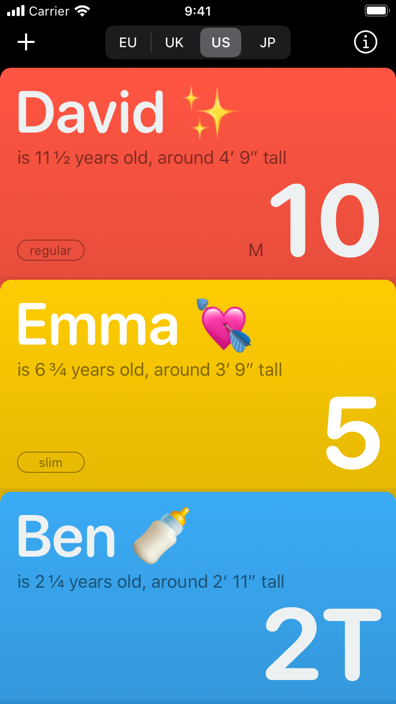 To perform body height estimation the app needs your kids' gender and date of birth as well as the height measurements you gave. »What fits when?« runs on Apple iPhone and iPod touch. I bought clothes at the size recommended by the app. Now they don't fit my kid! »What fits when?« uses standard clothing size charts for each supported country. Nonetheless clothing brands use their own patterns and size charts. Therefore you may sometimes need a different size than the one recommended by the app. 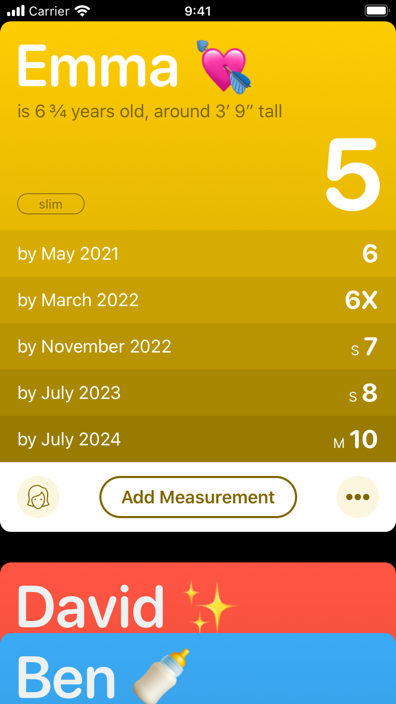 I measured my kid today and it turned out to be different from what the app said it would be! »What fits when?« tries to estimate the current body height using your previous measurements. Growth rate calculation is based on the WHO Child Growth Standards that contains statistical data collected from the whole human population. However all children are different and grow at their individual pace. How often should I add new measurements? Toddlers and small children grow at a pretty fast rate. To improve body height estimation you might want to add new measurements at least every 6 months. For older kids once a year should be sufficient. All body heights are shown in centimeters. How can I switch to inches or feet? Flip to any card's back, where the measurements are shown. At the bottom you may choose your preferred units: ”cm“ for centimeters, ”in“ for inches, and ”ft“ for feet. This will change the units for all cards. I added cards for all my kids. How can I rearrange them? With no card exposed at the top, press and hold the card you want to reposition. Now you'll be able to move it up or down. Just let go when it is at the right spot. I got the gender wrong when adding my kid. Can I fix this without deleting the card and starting over? On the card's back, where the measurements are shown, tap ”A Boy“ or ”A Girl“ in the top bar. You only have to confirm the change. Is it important to give the right gender in the first place? Yes, the correct gender matters, since »What fits when?« uses different growth charts to predict the height of boys and girls. Some of my kid's measurements show a little warning sign. What does that mean? »What fits when?« checks the data you enter and shows the warning sign when something seems implausible. Tap the symbol to get a hint. Why does the card of my older kid show some empty size prediction lines? In this case your child might have grown so tall that there is no fitting children's clothing size available in the selected country. Most probably you'll need to start shopping for adult sizes. What data does the app need and store? To perform body height estimation »What fits when?« stores your kids' gender and date of birth as well as any height measurements you enter. It also stores the names presented on the cards. What happens to my kids' data? Are they stored anywhere on the Internet? »What fits when?« stores your kids' data on your device and also performs height and size estimations on your device only. If you're signed in to Apple iCloud, data is automatically transferred to all other devices attached to the same Apple ID. Source: Durch den von Rechtsanwalt Sören Siebert bereitgestellten Impressum-Generator generiert. Apple, iPhone, and iPod touch are trademarks of Apple Inc., registered in the U.S. and other countries. App Store is a service mark of Apple Inc.